The little crockpot or "mini dipper" displayed here only has one setting. Mine has two: low and high. 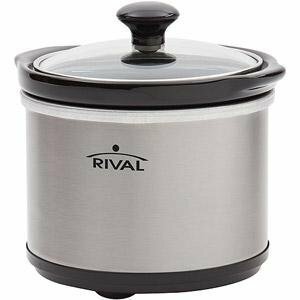 In the Amazon links below, you can check out a few different mini crockpots. You can also choose a mug which says "got crock?" because, why not? The mini dipper is touted as handy for making, well, dips. It is also good for preparing side dishes at the same time as the main dish is cooking in a larger crockpot or the oven. However, if you have a small number of people (between one and four) to serve, it is also great for making a small main dish such as the following cheesy barbecue turkey meatloaf. This recipe is suited for omnivores and is diabetic friendly. The original recipe included 1/4 cup of brown sugar, which I eliminated because the barbecue sauce already contains sugar. However, you are welcome to include it if you wish. Mix together in a large bowl. Blend in 1 lb ground turkey. This recipe provides just enough food for a small group of people and leaves minimal or no leftovers. It is easily doubled if you wish to make extra for an easy lunch during the week. It reheats well. Serve with potatoes and/or mini corn on the cob and a salad for a complete meal.